..."The Book of Three" ... was the first of five titles about a boy named Taran, an assistant pig-keeper who finds himself thrust into an epic struggle between good and evil in the magical land of Prydain. The setting was inspired by Wales—"Prydain" is the Welsh word for Britain—and the adventures were drawn partly from "The Mabinogion," a collection of Welsh legends. The books landed at precisely the right moment. J.R.R. Tolkien was enjoying his first big burst of popularity and Alexander offered a new stomping ground for veterans of Middle Earth. 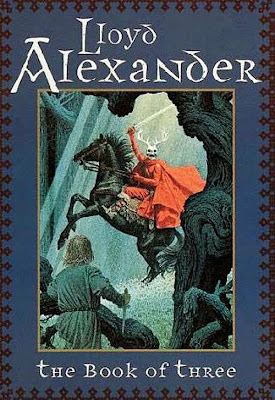 By targeting younger readers, "The Chronicles of Prydain" are closer in spirit to "The Hobbit" than "The Lord of the Rings." They're also funnier. Amid all the adventure, Alexander was careful to include episodes of comic relief. The fifth and concluding volume, "The High King," arrived in 1968 and won the Newberry Medal, the most prestigious award in American literature for children. A short sixth book, "The Foundling," came out in 1973. Its tales supplement rather than continue the Prydain series, which has never gone out of print. For Alexander, turning to an audience of boys and girls was liberating. "I found myself able to deal with things that I could never even express writing for adults," he said. "The child's book is as serious an art form as anything else." In his stories, he emphasized the importance of courage and duty, the conundrum of concentrated power, and the notion that where you're going matters more than where you're from. "Fantasy is hardly an escape from reality," he said of his preferred genre. "It's a way of understanding it."